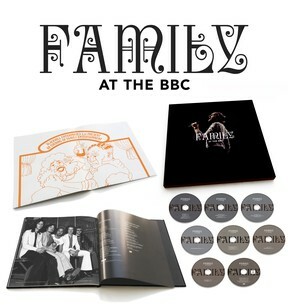 At the BBC is the most comprehensive release of Family's recordings for the BBC, featuring seven CDs containing tracks beginning with their first session for "Top Gear" on 26th November 1967 and running up until their last session with John Peel on 22nd May 1973. 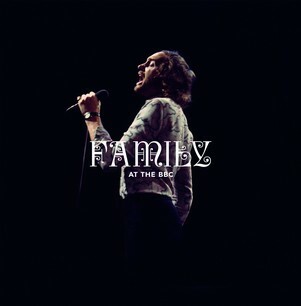 The eighth disc is a DVD of nine live tracks from iconic BBC shows including "Top of the Pops" & "The Old Grey Whistle Test" and a rare performance on ITV's "Doing Their Thing". This book set boasts 20 previously unreleased recordings including new versions of "Scene Through The Eye Of A Lense", "Old Songs New Songs" and "The Weaver's Answer". All CD audio has been newly remastered for this release. Also included in the 48 pages of this deluxe hardback book are John Peel's now legendary interviews, introductions and anecdotes, new liner notes, a rare poster replica promoting Family Entertainment and rare photographs including shots from the lens of Michael Putland & Jill Furmanovsky. At the BBC is presented in a deluxe hardboard slipcase. plus there's a very special offer!! : Yes I have to have this!